Can’t wait.Hopefully they come to Avalon. I happen to live on a hill to the south-east of Amberley (I can see the tyre smoke from C-17 landings through my binoculars) so I am naturally a dedicated RAAF aircraft devotee – and I gotta say, the way the Rhinos are flown is so different to the Pigs. Returning from the range (or refuelling practice, I guess) they look like they’re doing about 500 knots in a shallow dive when they are approaching Flinders Peak. Often in groups of 4, with the first two quite close to each other and the second 2 further from each other – why? One strange sight I see occasionally is a single Rhino approaching from the south, low and slow, with gear down – some kind of IFR approach? And boy are they NOISY – they make F111s sound like Cessnas…..I guess I could say they’re being flown like the boyz used to fly the Phantoms – like they stole it!!!!!!!!!! Last i knew 1 was flying the F already , what are they going to do with all those extra planes ? Congratulations must go to 6 Squadron for completing it’s final Super Hornet flight after 6 years of operation :-D. All RAAF Super Hornets will now continue to operate with 1 Squadron now and into the future and hopefully, the Growlers will become part of the Australian Defence Force sometime next year (2017) :-D.
They probably will, the first has already been introduced, probably 1 or 2 grlowers will come to Avalon. Dave the Hornet family were designed from the outset for Carrier landings, so they would probably have a faster landing speed. Sean 1 squadron will operate all 24 and rotate the Aircraft, still only have a squadrons worth of Crew but it will increase the aircraft availability. why have all F models flown by 1 squadron? Why not have 3 squadron take over the F’s and the 4 F35 Squadrons can be the in the 70″s….too many aircraft for one squadron me thinks. Could be wrong though! Dave,your last comments regarding our much loved F-4’s.For all interested….The F-4 will be officially retired from the USAF at Holloman AFB on the 21st December.Event open to the public from 0800 thru 1400hrs. Whilst I can understand the point you are making, I can’t see that it is achievable, without significant cost and interruption to the current plans and structures, I don’t think your suggestion is workable or necessary. When you suggest 3 Sqn take over the F’s, are you suggesting they move to Williamtown? If so then there is a big expenditure to set up the appropriate facilities to support the F’s, can’t see the value or practicality in that, or are you talking about leaving the airframes where they are at Amberley, but just changing ‘ownership’? What would be the point of that? As it stands at the moment (to the best of my knowledge), 3 Sqn is the first planned to convert to the F-35A in around 2018, then 2 OCU, and then 77 Sqn (all Williamtown based Sqns), then finally 75 Sqn at Tindal around 2021 or so, with FOC for the four F-35A squadrons being reached around 2023. That all seems to me to be an orderly and managed change over from the Classic Hornet fleet to the F-35A fleet. And at the same time, it doesn’t interfere with the operations of Amberley based 1 Sqn, with it’s 24 F’s and 6 Sqn with it’s 12 Growlers. Rolling all 24 airframes into the one Sqn, eg 1 Sqn, saves a lot of cost in raising a whole new training Sqn, duplication of overheads, etc, etc, just not necessary, and as the article mentions, operational conversion of Super Hornet pilots and air combat officers will now be undertaken by the USN, and 1 Sqns C Flight will conduct operational transition training, with access to those 24 airframes too. 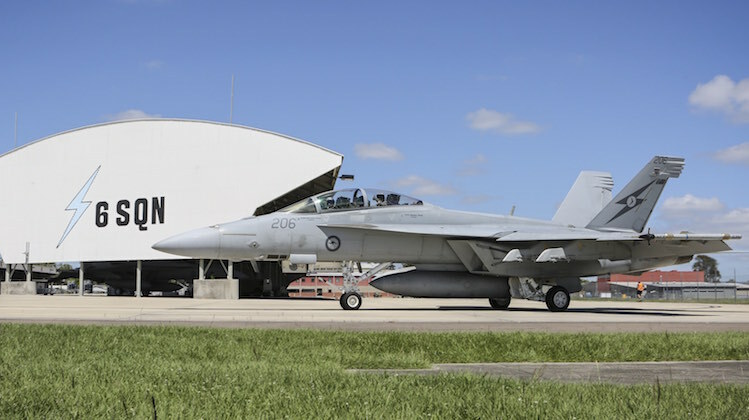 All seems pretty reasonable and logical to me, 36 Super Hornets and Growlers at Amberley, with all of the existing infrastructure, simulators, etc, in that one location (plus initial training in the US with the USN) and whatever new facilities are to be built (or being built) for the Growlers. 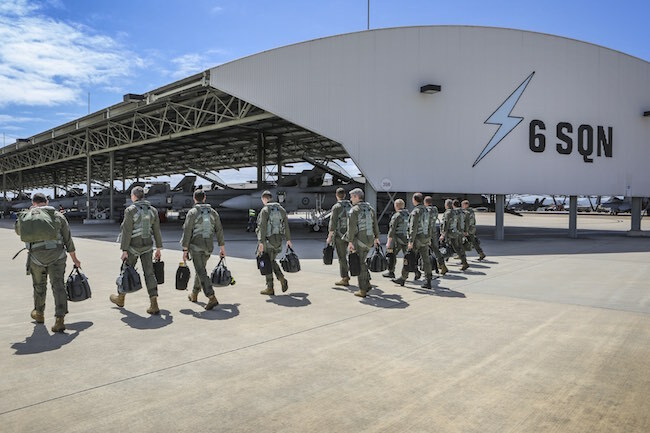 Eventually three Sqns of F-35A at Williamtown, again with all the relevant facilities and infrastructure in the one location and finally the fourth F-35A Sqn at Tindal. Anyway, just my opinion of course, but I think the RAAF has got it right on this one! What makes you think that because the Hornet has a high landing speed because it was designed primarily for carrier operations? It has a strengthened undercarriage because of carrier operations. From memory, the Mirage III landing speed was 170kts and the F18s is a lot less. Back in Mirage days, if you saw the AB on base, then you knew the pilot had let too much energy bleed off. Fabian,1-2 growlers for Avalon?U sure?That would be nice. I have to agree with Tonks,the Rhino is louder than the pig. We may see in time 1 Sqn gradually increase in size until it is able to split in to 2 squadrons of 12 Super Hornets each. I did here a rumour a few months ago, that if the decision to do that happens, the “2SQN” numberplate would return to 82 Wing to operate 12 of the Super Hornets, and the “12SQN” numberplate would be reactivated for the E-7A fleet, and would fit in with sequence with the other Surveillance and Response Group flying squadrons (10SQN/11SQN). Standing up another squadron by gradually increasing the size 1SQN would be a lot easier than just trying to stand up another squadron overnight that’s for sure! You could always use a few of the F-18Fs in 2 OCU. Given that there are no F-35 two seaters it could be that these aircraft will have a very important role to play over the next couple of decades. Not only will they train Super Hornet pilots but they might also be useful for easing the transition of pilots from the Hawks to the F-35. There really is no point in 2 OCU ending up with a ‘few’ F/A-18F’s, if pilots are going to ‘need’ to fly in a two seater before moving onto ‘further’ training in 2 OCU’s single seat F-35A’s before then moving onto one of the three operational F-35A squadrons, then there is something badly wrong with the training system. The ones that successfully complete their training in Hawk 127’s will then spend a significant amount more time learning on the F-35 simulators before stepping in to the ‘real thing’, from what I read a little while ago, there are now around 300 trained F-35 pilots, including RAAF and other international partner pilots too. The system seems to be working! And John N I was thinking that all Super Hornet Squadrons stay at Amberley. Well done our RAAF guys they need our support like the other service’s.